Buyers can be more selective and take their time negotiating in a buyer’s market. Buyers will have more time for due diligence before signing a contract and can often successfully bid below the listing price. Sellers will need to be highly disciplined in pricing their property realistically and showing their property as often as possible during a buyer’s market. Will 2019 be a buyer’s market? A real estate buyer’s market is a market environment where housing inventory exceeds demand, and bona fide home buyers are harder to find. A buyer’s market can occur for a variety of reasons, such as an economic recession, mortgage rates moving higher or simply an unsustainable increase in housing supply. 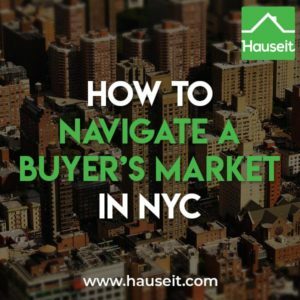 Buyer’s market examples in the NYC real estate market include the Great Financial Crisis of 2007-2008 and the current buyer’s market of 2018-2019. The former buyer’s market occurred because of a severe recession in the general economy and the tanking of the stock market. The latter is occurring today because of mortgage interest rates moving higher along with an unsustainable increase in new housing developments. Pro Tip: What is a contingent offer on a home? Read our article to learn more and why contingent offers may be more acceptable in a buyer’s market. And if you do intend on using a contingency, then make sure you understand which home buying contingencies actually matter and which are customary. 2019 will likely be a buyer’s market because interest rates are widely expected to continue to increase, which means higher mortgage rates and reduced activity from financed buyers. Furthermore, many new construction buildings are still being built and due to come online in the following years, such as the huge amount of new developments in Hudson Yards. Even though the announcement that Amazon will build a headquarters in Long Island City helps absorb some of the supply glut, it won’t be enough given the huge amount of supply overhang. For example, Long Island City has been the site of frenzied new construction over the past few years, and while Amazon’s announcement may help soak up some of the localized supply in Long Island City, it’s not expected to make much of a dent on overall supply in the city. Pro Tip: Even though 2019 is forecast to be a buyer’s market, it’s unlikely that we will see short sales and foreclosures on a wide scale. However, you never know, and we recommend that you understand what a short sale is and how a coop foreclosure works in case the market really tanks! 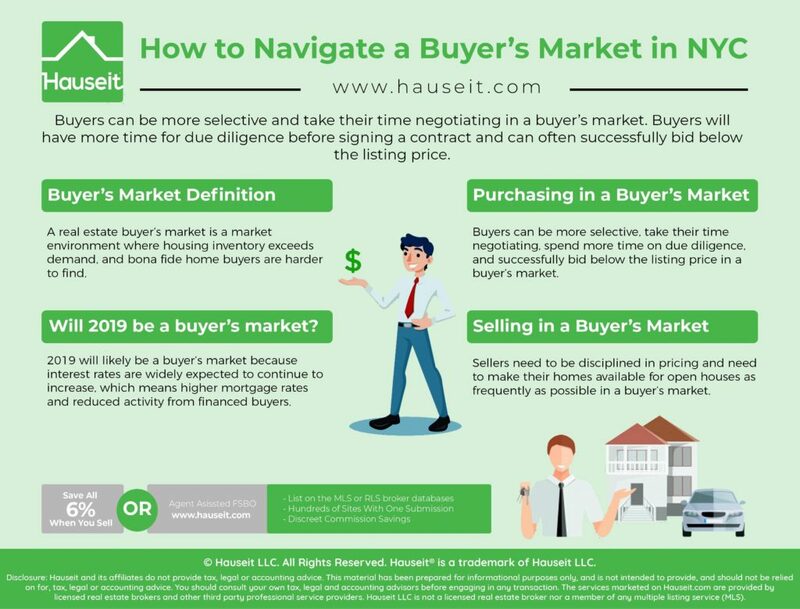 Buyers can be more selective, take their time negotiating, spend more time on due diligence, and successfully bid below the listing price in a buyer’s market. Greater Selection – Buyers won’t feel pressured to make offers on properties that aren’t perfect for them. They’ll be able to pick and choose and wait for new listings that they love. In contrast, buyers may feel pressured to buy something they sort of like just to be able to lock in a place to live in a seller’s market. Time to Negotiate – Buyers won’t be pressured to make a decision because of other bidders. In fact, it’ll be much more likely that you’ll be able to negotiate for an extended amount of time with a seller without worrying that he or she will sell to someone else. In contrast, in a seller’s market the buyer may have to rush to submit ever higher offers in competition with many other bidders. Thorough Due Diligence – Buyers can spend more time on legal and financial due diligence before signing a purchase contract in a buyer’s market. 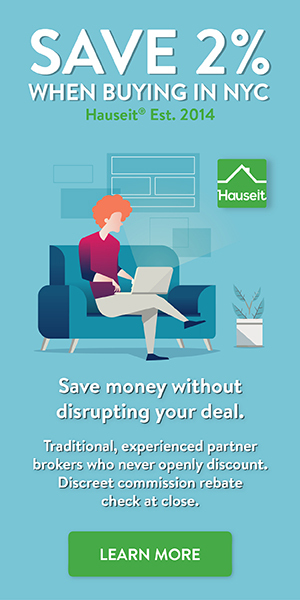 Instead of only having 5 business days to sign a contract in a competitive situation, they can take as long as they need assuming that the seller doesn’t have a legitimate other option. Bid Below the List Price – It’s much more likely that an offer below the listing price will be accepted during a buyer’s market. In fact, market psychology will tilt in favor of buyers so much that sellers will expect all buyers to make an opening offer below their listing price. Just remember, if the listing is already priced in line with the market, it’s considered rude to make an offer more than 10% below the listing price. Bid on Multiple Properties – Buyers should keep their options open and bid on multiple listings regardless of the market condition. However, buyers will have much more accepted offers to choose from in a buyer’s market if they make reasonable offers on multiple properties. We recommend making an offer on a property at the price that it would be worthwhile for you to buy, even if you’re not completely in love with it. You never know in a buyer’s market, a seller may actually agree and make it worth your while! Pro Tip: How long does a seller have to accept an offer? While there aren’t any rules around this and sellers can take as long as they want, they will generally respond quickly and within 1 business day especially in a buyer’s market. Sellers need to be disciplined in pricing and need to make their homes available for open houses as frequently as possible in a buyer’s market. Undercut the Competition – Sellers should underprice their homes relative to comparable properties on the market. Buyers will be looking for bargains, and due to the supply and demand dynamics will focus their efforts on sellers who appear to be realistic. Just remember, real estate is a relatively transparent market these days, and how you price your property is the single most important factor in how long it will take to sell your property, if it sells at all. Show Frequently – Sellers should show their property as frequently as possible in a slow market. Remember that buyers only put offers in on listings they’ve actually seen. As a result, try to host as many open houses and private showings as possible. You should try to hold an open house every Sunday afternoon, ideally for 2 hours sometime between 11am to 4pm. Saturdays are less popular in NYC, but can also be beneficial if you’re able to hold open houses both days. Open Houses By Appointment – You should have an open house by appointment only posted if you don’t plan on holding an open house. That’s because an open house by appointment is non-committal. The listing agent won’t need to show up if no one makes an appointment. However, just having some sort of open house listed is a very powerful signal because it tells potential buyers that the property is still available. Avoid Aspirational Pricing – It’s extremely dangerous to hang on to hopes for valuations at the peak. If you price your property too high, you will hear crickets as your days on market creep higher. Ultimately, your position will become weaker and weaker as new listings continually come on the market at lower prices. Ultimately, when you are forced to reduce your price after many days on the market, you will be viewed as the classic desperate seller who obviously has no offers. This is a horrible situation to be in especially if you actually need to sell, because if you do then you can easily be backed into a corner by a vulture investor who knows as well as you do that you have no other offers or options. Pro Tip: Trying to sell For Sale By Owner may be on your mind in a bear market. However, you won’t have access to the MLS broker database as a traditional FSBO seller. Do free MLS listing services exist? 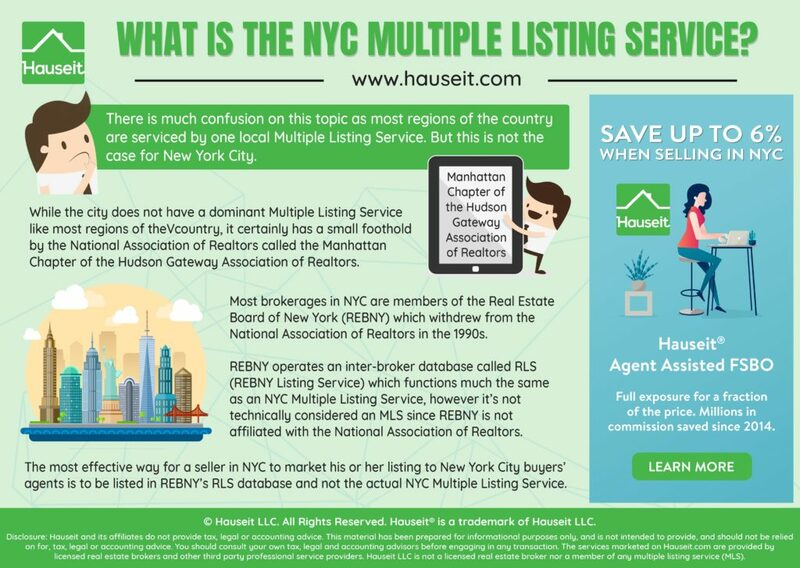 What options do sellers have to list their home in the NYC Multiple Listing Service?